Pack everything you need before heading to the gym, a camping trip, or a sudden business trip using the Quest Duffel Bag. Embroider your business logo in bold on the bag for prominent brand exposure. Pack everything you need before heading to the gym, a camping trip, or a sudden business trip using the Quest Duffel Bag. Embroider your business logo in bold on the bag for prominent brand exposure. The duffle bag is made from a combination of 600D and 300D polyester. 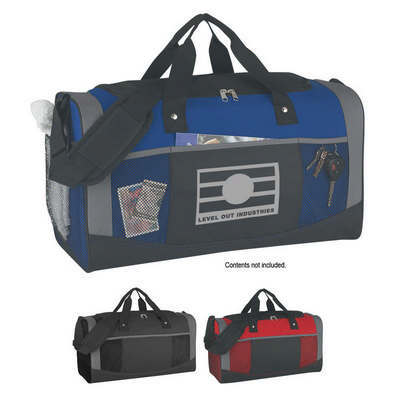 It has a double zippered top compartment and a matching covered bottom insert. Three front pockets and a side mesh pocket provide additional storage space. The adjustable padded shoulder strap and web carrying handles enable easy transport. Gift this bag at marathons, hiking trails, and to anyone leading an active lifestyle, to effectively promote your brand.